Got similar questions and sfeikos? Let me tell you. 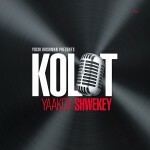 If you love Shwekey – you will love Kolot even if you’re not such a fan of Sefardi music. He sings from the heart and still emanates his personality like the regular Shwekey albums you cherish. Now if you are a fluent Hebrew speaker – which I am NOT, you will love this even more! Let’s talk about some of the songs on the album. The album gets off to a fast start with “Am Yisrael” composed by Yishai Lapidot. It’s an upbeat geshmake song that gets you dancing. The theme is about how Klal Yisroel should have Emuna and courage in the face of danger. The next song is the theme song of the album – “Kolot” which is a slow song composed by Tomer Adaddi and features a guest solo named Shlomi Shabat. Hey , backup vocals are by Yochi Briskman! “Kolot” means voices and it describes all different voices looking for chizuk. The next next one is called “Smechim” and is in between fast and slow. It starts off with the high part “shevach notnim lo” As soon as I heard it, it stayed in my head for hours. It’s so catchy and geshmak. Composed by Shwekey and Yitzy Waldner. Yaakov’s high voice really shines here. Ach Sameach is a hora that is composed by Udi Tamari. I always like songs that have lyrics that are meant to be mechazeik. This features words from Rav Nachman of Breslov zt”l as wellas from zemiros Shabbos and the words Shelo Asani Goi. Further there is a song called “Osim Tshuva” with a guest appearance by “Metallish”. It is an upbeat somewhat rocky song that talks about getting people to wake up to do Tshuva. There may be difference of opinion about a serious subject like tshuva being sung this way. I remember when MBD came out with “Brosh Hashana” on Efshar Letaken and some people had objections to its upbeat nature. My opinion is that every person is touched by different notes and music styles and I believe that this tune can have the proper influence and motivation for the listener. Number 9 is “Et Rekod” composed by Yitzy Waldner and Yaakov Shwekey. It’s about dancing and really gets the dancing juices flowing. It has a real unique introduction. Get this album and you will find yourself to it over and over!